In 1714, in the small mountain town of Megalo Dendro in Aetolia, a boy was born. Little could anyone have guessed that this child would someday become not only a great Orthodox saint, but also a historical figure, who would determine to a great extent the fate of the Balkan region. Little is known about Constas’ parents. They were both weavers. His father, Dimitri, came from the village of Grameno, and his mother was born in the village of Vlachochori. Because of repression by the Turkish authorities, they were compelled to flee Epirus and settle in Aetolia in 1700. There they gave birth to two children— Сonstas and his older brother Chrysanthos. The foundation of St. Cosmas’ parents’ home. Greece was experiencing difficult times. Barbarism and illiteracy were spreading, and some regions were isolated from each other. “Some of the people read and wrote however they could, while a large part was engulfed in total illiteracy.” People hid themselves in the tall, impenetrable mountains, gradually losing their connections with neighboring settlements, and becoming culturally separate. In the mountainous regions there were many bandits who would attack not only representatives of Turkish government but also their own countrymen. Many villages were without churches, and consequently, without schools. “No one took care for their faith; not for their language, nor for their national or social sensibilities. Total illiteracy and wildness flourished in those areas—local beys and regional princelings ruled over them like petty tyrants. After the conquest of the Byzantine Empire, the educational system reached a state of deep crisis. It was provoked by a set of causes that were the consequence of the fall of a nation: scholars and educated people fled to the West, a demographic crisis ensued, social networks were broken up, and the cities declined. The foundation of a small number of schools in the more developed regions of Greece could not change anything substantially for the better. The problem lay in the complete absence of any organized educational process; during the years of Turkish rule, in many areas, the population no longer felt the need to receive an education, and nothing was done to correct that situation. This is the period that saw a wave of mass islamization of thousands of Christians, mainly in the distant and inaccessible regions. The acceptance of Islam often bore a massive and voluntarily character. Some strove to attain high positions and tax advantages; others, after a series of bloody suppressions of national resistance uprisings, lost hope in ever being freed from the foreign yoke. More and more people were abandoning the faith of their fathers. Forgetting their country’s former grandeur, they no longer placed their hope in a great future. Cosmas remained in his village until he was twenty, helping his parents in their work. Life amongst his simple, impoverished, at times illiterate countrymen not only determined his decision to devote himself to the work of his nation’s renaissance, but also aided him along that path. He was aware of the villagers’ problems first hand, and could communicate with his countrymen as an equal and not as an office academic acquainted only theoretically with the situation—any of whose attempts to missionize the people were doomed to failure. In Cosmas’ homeland of Aetolia there were many monasteries: St. Parasceva in Mandra, St. John the Baptist in Dervikste, the Dormition of the Mother of God in Katafigi… Monasteries at that time were not only spiritual, but also educational and social centers. Probably the saint received what was called “sacred” learning in one of these monasteries, which consisted in reading, writing, basic arithmetic, prayer, and Church services. For eight years, Cosmas studied under the guidance of Hierodeacon Gerasim (Litsikas) in Sigditse. After ten years of study, he returned in 1732 to his homeland. At age twenty he had begun to study grammar in the community school of Lombotina. Cosmas was a capable and gifted student, and in the same year of 1734 he was appointed as teacher to the Lombotina community. Such a practice was widespread at that time: capable students often combined their study with teaching. During winter St. Cosma taught in the church, and in summer under the shade of a tree. He knew the textbooks by heart and taught without looking at the books. His method of teaching was somewhat advanced, and differed in many respects from the generally accepted educational methodology. He preferred a living dialogue with his students over a didactic monologue. Striving for complete trust and mutual understanding, Cosmas did not use physical punishment. On Sundays he talked with his compatriots, expounding on the Gospels and service texts to them. The saint tried to use not books, but a language that would be understood by simple people. Folk tradition has it that the first school opened by St. Cosmas was already functioning then. It was located in Aetolia, in the village of Taxiarchis. Constas continued his education in Elinomousiou Vrainon. This educational institution was opened at the monastery of St. Parasceva by the well-known preacher, Eugenios Yannoulis. There Cosmas studied the vast monastery library, which preserved thousands of rare manuscripts. He associated with scholars who had refused emigrate to the West, and who had hidden themselves in the monasteries. Besides his humanitarian disciplines, Cosmas was able to broaden his knowledge in arithmetic and geometry. How long he studied we don’t know, but probably he remained there until his departure for Mt. Athos, combining his studies with teaching. On Mt. Athos, Cosmas not only received the necessary knowledge, but was also strengthened in his resolve to dedicate himself to the work of enlightening the people. Cosmas was there not just due to circumstances—he considered foreign study inacceptable, and Athos was the only place in Greece where he could receive a fundamental education. There he not only became firmer in his faithfulness to the Orthodox tradition, but also found people of like mind with him, who strengthened his faith and resolve to facilitate a national renaissance. Cosmas gradually prepared himself to carry out his intentions: he studied patristic literature and the Holy Scriptures. He was also aided by lessons in rhetoric which he later received in Constantinople. Cosmas arrived in Constantinople with the firm intention to begin his activity as a preacher. There he revealed his thought to the blessed hierarchs and teachers, and hearing that they all with one voice encouraged him to begin this godly work, he took the blessing of Patriarch Seraphim. Seraphim was from Delvino, and thus was well aware of the tragic situation in mainland Greece. Furthermore, before ascending the Patriarchal throne he was the metropolitan of one of the most problematic regions of Greece—Thrace and Aetolia. We can suppose that Cosma’s first missionary route was charted with the Patriarch’s participation, who regarded with great enthusiasm the mission Cosmas had taken upon himself. Cosmas’ travels and activities would be traditionally called missionary. But is that term entirely appropriate? After all, at the time of his preaching, many inhabitants of the Balkans were already Christians. Without a doubt, the preaching of Orthodoxy was entirely justified and relevant—part of the population had voluntarily accepted Islam, and Catholic and Protestant propaganda was on the rise. The influence and authority of Western Enlightenment was also growing. 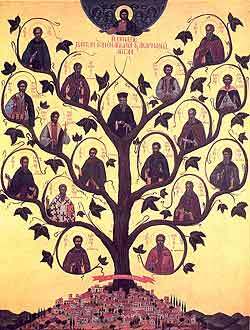 Many Greeks, Serbs, and Bulgarians remained Orthodox only in name, but not in spirit. They were little acquainted with the basics of Orthodox teaching, and had departed from the patristic tradition. Cosmas’ missionary activity was multifaceted—on one hand, he strove to return those who had left Orthodoxy to the Church’s bosom, and on the other hand, he wanted to renew the purity of Christian life, spread the patristic tradition, and strengthen the people’s unity. St. Cosmas visited not only Greece with his preaching, but also Bulgaria, Serbia, and Asia Minor. “Thousands of towns and villages have not heard the word of God,” said Cosmas in one of his lessons. Understanding the complexity of the situation, he travelled through practically the entire territory of the Constantinople Patriarchate. He gave particular attention to the regions that had the threat of islamization and the loss of their national cultural identity hanging over them. Thus, he was in Northern Epirus several times, visiting the same settlements repeatedly and supporting the local inhabitants with his fiery sermons. At first the people did not always greet the preacher with enthusiasm. 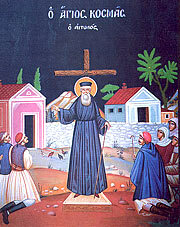 Dorotheos Voulismas, the famous preacher, after completing a series of travels around mainland Greece, wrote in one of his letters that he is cautious about preaching in public places and near churches, “considering the danger that Cosmas underwent during his preaching.” Voulismas described the difficulties he came up against, and spoke of the mistrust and even animosity of the local population. Hundreds of preachers and scholars had made attempts to enlighten their compatriots. Why didn’t their missions produce any significant results? Some gave up at the first hardships encountered; others were not prepared for such a responsible and selfless service. Not having a well thought out plan and program of action or the necessary knowledge and talent, they quickly despaired, not managing to overcome the initial difficulties that arose. Nevertheless, St. Cosmas did not give up, and selflessly carried on with his work of enlightenment, which was bound up with a multitude of dangers, depravations, and heavy trials. The saint spoke with the people not as a teacher with his students, but as an equal, in a simple and accessible language, and not in archaic bookish language. The people did not understand that kind of language, and it therefore repelled and estranged them; these feelings were inevitably transferred to the preacher. The people began to greet the saint enthusiastically; thousands of people followed him, along with nearly forty priests. Eventually praise of him spread throughout Greece, and tens of thousands of people came to hear him preach. Due to the multitude of people which no church could possibly contain, Cosmas often had to preach outside the village, in the fields. Therefore he had the custom of announcing beforehand where he wanted to stop and deliver his preaching. In that place they would prepare and erect a large wooden cross, then place a bench at its base on which Cosmas would stand and preach. At the end of the preaching, Cosmas would take the bench, but leave the cross in its place as a continual reminder of his sermon. Later the Lord manifested a multitude of miracles in those places where the crosses stood. The crosses left by St. Cosmas of Aetolia were preserved for a long time in many of these inhabited areas. They often renewed themselves, and many of them have survived to our days. In those places where they did not survive for one reason or another, the sites have been marked as places of veneration, and many of the mountain villages where crosses had been erected received the name of Stavros, which means “cross” in Modern Greek. Aetolia is a region in central mainland Greece. Constas (Konstant) was Cosmas’ name in the world. Chrysanthus later became a famous historical and ecclesiastical figure, who also did much for the rebirth of Orthodoxy in the Greek lands. Κούμας Κ. Ιστορίαι ανθρωπινων πράξεων. Τομ. 12. Βιεννή, 1832. Σ. 555. Πετσάλη Θ. Οί μαυρόλυκοι. Αθήναι, 1948. Τομ. Β. Σ. 225. In those days, “grammar” indicated a systematic education. Sigditsa and Lombotina are inhabited areas in Etolia. Their use was generally accepted in educational systems of the time. St. Cosmas was one of the first to raise the issue of discontinuing that practice. Eugenios Voulgaris was the bishop of Ekaterinoslav and Cherson from 1775 until 1779. An outstanding monk and scholar, representative of the traditional (Orthodox) thinking and Greek social order. He was appointed as the director of the Vatopedi school in 1753, and taught there until as late as 1799. Seraphim was the Ecumenical Patriarch from 1757 to 1761. Despite the fact that the Orthodox who lived in the Venetian territories were not deprived of access to an education, St. Cosmas considered it necessary to spread Orthodox traditions and education free from the influence of Western ideology. This is the explanation for his work in the founding of schools in these territories. Testimony of contemporaries show the tragic situation that evolved in this province: “In many villages … there was such illiteracy that their inhabitants only knew about the onset of Pascha thanks to the appearance of red eggs at the marketplace of Berata.” Because of his steadfastness and selflessness the preacher was able to turn the situation around. He continually supported the longing in these people for knowledge, did not abandon newly created schools, watched after their functioning, and strove with all his strength to support and develop them. In Northern Epirus there lived not only Albanians, but also a significant portion of Orthodox Greeks. Cosmas tried to strengthen their resolve to preserve their Orthodox faith. He also strengthened their unity and solidarity, and their resolve to withstand assimilation. Ζαχαρόπουλος Ν. Δωροθεος Βουλησμάς. Θεσσαλονίκη, 1969.Σ.26-27. Περραιβός Χ. Συντομος βιογραφία του λοιδίμου Ρήγα Φερραίου του Θετταλόυ. Еν Αθήναις, 1860. Σ. 50-51. Καισάρη Χ̣ Ο Αγιος Κοσμάς εν Ηπείρω.// Ηπειρώτικη Εστία 22 Φεθρ. 1930. Manuscripts with texts of St. Cosmas’ sermons were well known even during his lifetime, and after his martyric death their dissemination took on unprecedented proportions. St. Cosmas’ sermons and letters were so popular amongst the people that they were even read at church services. The influence St. Cosmas had on his contemporaries was truly unprecedented; it is important to note that many of the preacher’s teachings were not only well received by the listeners, but were also embodied in practice by the simple folk. With money donated by wealthy benefactors St. Cosmas obtained over four hundred thousand headscarves, and over five hundred thousand prayer ropes and crosses. All this was distributed freely amongst the population of the Balkans. At St. Cosmas’ request, wealthy benefactors purchased over four thousand baptismal fonts.Distinguished by their particular breadth and diversity, the saint’s teachings were addressed to all different levels of society. Despite the fact that certain major landowners openly spoke against the preacher, many influential people were deeply impressed by his work of enlightenment. The famous Ali Pasha of Ioannina had a deep respect for the preacher’s work, and revered the saint himself as a great and righteous man and as one of the most outstanding personalities of the era. They were personally acquainted, and the Pasha always protected the saint, providing every support for his work of enlightenment. St. Cosmas communed with the people not through his texts, but in a much more direct way—by living sermons and by his very manner of life. Therefore, in order to comprehend the scale of his contribution, we must have a look at the reaction of the crowds who followed him. The contribution of St. Cosmas of Aetolia to the spiritual and national renaissance of the Balkans was not only in his own sermons, which covered practically every level of the population, but also in the foundation of a large number of free schools. “He founded schools everywhere through his teaching,” writes St. Nikodimos the Hagiorite. Apparently, he was referring not only to the schools St. Cosmas opened during his missionary journeys. The fact is that St. Cosmas was not able to visit every village personally, and so he usually met the local people in “kefalochori”—the central village of the region. People gathered there from the tiny or inaccessible neighboring villages. “Seeing the great number of people gathered from the neighboring settlements … he chose a spacious place and began preaching.” In the “kefalochori” he usually opened a school himself, and scrupulously explained in his sermons the schools’ order and aims, describing how they should function. It is logical to assume that the inhabitants of other villages would follow his advice and found schools upon their return to their own villages. The number of schools about which there is reliable information confirming that they were opened by St. Cosmas himself during his travels is impressive. “Through the saint’s teaching and according to his instructions, schools were opened everywhere, in populated areas both large and small, where children were taught without payment the sacred literature, and were thereby made steadfast in their faith and piety, beginning a new, virtuous life,” writes the saint’s biographer. That this is no exaggeration, and that the word “everywhere” in this case is used to show not only the territorial scale, but also the vast quantity of these schools, is confirmed by the unparalleled growth in the number of educational institutions in the late eighteenth, early nineteenth centuries. “From Wallachia and Moldavia all the way to Egypt, from Smyrna to Kerkera, there is not a single town, not a single island where you will not find a school providing free education, functioning on the community’s funds,” writes an English traveler who visited Greece in 1808. The majority of these schools where either built by St. Cosmas or under the influence of and in accordance with his teachings. Memory of the schools opened through the efforts of St. Cosmas is preserved to our day. In some places they are still functioning, in others the school building is still standing, in some places there is a wall or a foundation. Thus, in the village of Zitsa the villagers lovingly preserve a part of the wall of an old school, and the name Didaskalio (the name of the school given it by St. Cosmas) is borne by the entire region surrounding it. As a good pastor, St. Cosmas continually associated with the inhabitants of the villages where schools were built through his efforts. He inspired people, supported their zeal, gave them practical advice. St. Cosmas conducted a correspondence with the inhabitants of many cities, villages and countries. His letters were important for the local inhabitants not only as practical instructions for action, but at the same time, they were as a blessing from a saint who they so venerated that they preserve and cherish these epistles to this very day. Cosmas took care not only to open schools, but also to provide them with teachers. He appointed the teachers and provided them with financial support and a place to live; but most importantly, he was able to establish the preparation of new teachers. 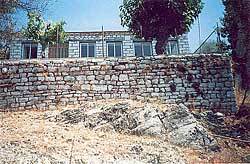 At the Patriarchal monastery of Stylou he organized a Higher School, the main task of which was to prepare teachers and preachers who would continue his work. He founded a similar school at the monastery of St. John the Theologian. The solidity and thorough consideration with which he approached every problem that he happened to encounter is truly amazing not only for those times, but unparalleled for all times. It is precisely thanks to this that the educational system created by St. Cosmas of Aetolia did not fall apart even after his death, but to the contrary, continued to function and develop. The first source of funds for building schools was a portion of the community and church lands and their income. The next source was donations and gifts brought to the saint, which he very quickly directed towards the building of new schools. People donated to the saint for schools and for personal needs; the benefactors included the Orthodox, and wealthy Turks as well. He never left anything for himself, but directed all the funds towards the construction of new educational institutions. If donations were insufficient, he organized a collection amongst the people. Thus, the observer for the Venetian authorities, Dimitri Mamonas, speaking of a three-day collection of funds organized at the preacher’s initiative, testifies that he gathered a colossal sum. National renewal is inseparable from spiritual renewal, and therefore Cosmas thoroughly told those who had lost their connection with Orthodox tradition how necessary it is to live in accordance with Orthodox teaching; he told them about the meaning of rites and sacraments. In his sermons, he described the construction and use of various parts of the church, and related how the sacraments of marriage and baptism should be conducted. St. Cosmas played a key role in the attainment of the unity of a nation that subsequently made it possible to succeed in a national liberation rebellion in 1821. It is no accident that one of the key points of St. Cosmas’ educational concept was the general and free character of teaching. Thus, he practically embodied by his concept the acquisition of national unity, making no distinction between the rich and the poor, girls or boys. General education was to deliver the nation from social prejudices, nullify the privileged status of certain wealthy groups of the population in comparison with the underprivileged, who traditionally remained outside the framework of the existing educational system. As a result, this provided conditions for a commonality in the struggle for their homeland’s freedom. Studying in one school, they could see that what bound them together was incomparably more meaningful than the material and social positions dividing them. An important element of Cosmas’ concept was the moral preparation of his countrymen to be freed from the foreign yoke. After a series of unsuccessful anti-Ottoman uprisings, many gave up, considering freedom as unattainable. Cosmas’ sermons and prophecies gave the people hope, and it is no coincidence that handwritten lists of these prophecies were spread throughout Greece. The prophecies of the saint “became the favorite reading material of the Greeks.” These texts bore faith in imminent liberation. Their own forces, united with faith in God, were to bring soon and inevitable “longed-for” liberation. He gave hope through his conviction to his compatriots, inspiring them for new feats and struggles. In St. Cosmas’ teaching, the Church is not only a spiritual and social center, but also a center of education. The school is not in opposition to the Church, but harmoniously supplements it. “It is better to have a Greek school than springs and rivers. And when you teach your son to read, only then, my brother, will he become a man … the school opens the Church.” Cosmas was not a moralizer, and did not place himself above his audience. The success of his sermons was aided by his sacred belief in the meaning of his mission, and also in that they were a living example of how to follow traditions in difficult modern conditions. Cosmas “did not consider himself to be an advanced Enlightener, but an apostle of Christ.” This placed specific demands upon him, and he selflessly strove to fulfill his obligation before his countrymen. The foundation of St. Cosmas’ social-political concept were composed of “true faith, true education, and an integral social teaching.” Nevertheless, his role in the renewal of the Balkans cannot be narrowed down to these three elements, however extremely important they may be. It is telling that St. Cosmas’ teaching played a very great role even in the rebirth of agriculture and the creation of an economy—the preacher gave the local inhabitants advice on how to care for fruit trees, he was the first to tell them about the need to inoculate the trees, and this naturally led to an increase in harvests. Possessing a basic knowledge in many areas of science, St. Cosmas was doubtless acquainted also with the latest innovations in agriculture. He cared not only for the spiritual salvation of his flock, but also strove to help them harmoniously order their life on earth. In this context, his relating the latest agricultural innovations is perfectly justified and appropriate. The saint’s popularity and increasing influence increased also the number of his enemies—the elite and the moneylenders, whose abuse Cosmas rebuked, the wealthy Jewish merchants who suffered enormous losses after the market day was shifted from Sunday to Saturday—all began to passionately desire the preacher’s death. Seeing the saint’s popularity, the success of his sermons, which brought practical results and grew more and more in significance and scope, the enemies of Orthodoxy did everything they could and couldn’t do in order to ensure his death. St. Cosmas himself felt how numerous were his enemies and often said in his sermons that he is ready to receive a martyr’s death. The saint remained true to his obligation before his compatriots to the end, and made no compromises with the authorities and powerful of this world, who strove to disrupt his God-pleasing work. It was the year 1774, and St Cosmas of Aetolia was in the peak of his popularity; the number of his followers and students increased, but his enemies had already implemented a crafty and sophisticated plan for his capture and murder. The wealthy moneylenders and merchants (who had suffered such great financial losses) paid Kurt Pasha twenty-five thousand coins for Cosmas’ head. The size of this sum is shocking—in those days, one could buy 12,500 head of sheep for that amount. In today’s currency, this sum would equal 1.5 million dollars. On the one hand, this shows the hatred of Cosmas’ enemies for him, and on the other hand, it shows that his activity really was bearing fruit, and was dangerous to his enemies. 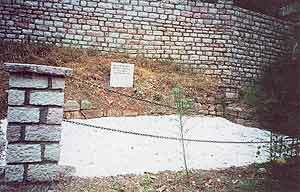 On August 24, 1774 the saint was hanged, and his body was thrown into the Aps River. His martyric death did not mark the wane of his remembrance. The name of the great saint remained for eternity, while the names of his enemies, who were impotent to oppose the truth, were forever forgotten. At the translation of the saint’s relics to the city of Ioannina, and later to the monastery founded in honor of Ali Pasha of Ioannina, a multitude of people came from all over the Balkans. “Merchants came from out of their stores and reverently crossed themselves. The innumerable crowd of people gathered along the road of the procession. Part of Ali’s mounted guard followed after the Romeian monks. The monks’ singing united with the people’s prayers, which loudly repeated the words, ‘Lord have mercy!’ The cemetery that was located opposite the Sarai (court) was black from the people gathered there,” wrote a Frenchman who became a witness and direct participant in these events. There are many testimonies to St. Cosmas’ preaching in the Balkans. He left wooden crosses along his path. Nikolaos Mistikadis wrote at the end of the eighteenth century that the crosses left by St. Cosmas of Aetolia “are preserved in the villages of Votrisi, Lia, and Mousini.” The crosses often renewed themselves and many of them are preserved to our times. In places where they are not preserved, sites for veneration were established. Immediately after St. Cosmas’ death, many churches were built in his honor, and many icons were painted. Neither has his memory died on Mt. Athos. Besides a special veneration for the saint, there are also material testimonies to his time on the Holy Mountain. Unfortunately, the library in Philotheou Monastery burned, as did the school where St. Cosmas studied. Nevertheless, during our last visit to Mt. Athos, the brothers of Philotheou showed us an epitrachileon which, according to tradition, belonged to St. Cosmas, and an analogion preserved from the time he lived in the monastery. These objects are reverently preserved in the monastery museum. Even in our times there are testimonies to the sermons of St. Cosmas. Thus, in the village of Arnea, many inhabitants were so impressed by their meeting with the preacher, which changed their lives entirely, that they all took his name as their surname. Today in Arnea over fifteen families have this surname. The surname “Cosmas” became very widespread in other areas of Greece as well. The inhabitants of the village of Tsiraki gave their village the name, “Agios Cosmas” as a sign of their gratitude to the saint. The inhabitants of central and eastern Greece relate that their childhood was closely bound up with the prophecies of St. Cosmas—the whole family discussed them, and passed them on from one generation to the next. Faith in the fulfillment of the saint’s prophecies is preserved in Greece to this day. During the general mobilization in 1974, people in certain villages gathered in the churches and said, “The time has come for the fulfillment of what St. Cosmas said.” Some women drew the sign of the cross on their foreheads, fulfilling the prophecy: “Let there be a cross on your foreheads, then all will know that you are Christians.” Our last trip to Greece and questions to the local population showed that people know well and continue to believe in the fulfillment of the prophecies of St. Cosmas. This faith is characteristic of all layers of the population, including the intelligentsia. The heritage of St. Cosmas is definitely relevant to modern Russia also—the spirit of true monasticism is especially necessary in our country today, when the educational system is in a crisis, families are falling apart, and the Church is in danger of becoming worldly. Monasticism shows us another way—the way of social and civil responsibility, of self-transformation, personal spiritual salvation together with responsibility for our country. Σ. Χριστοδουλίδης. Βιος και ακουλουθία Κοσμά του Αιτωλόυ. 1996. Σ.13. Стр. 19. Περραιβός Χριστόφορος. Συντομος βιογραφία του λοιδίμου Ρήγα Φερραίου του Θετταλόυ. Еν Αθήναις, 1860. Σ. 51. Γ.Φινλευ. Ιστορία της Ελληνικής Επαναστασεως. Τομ.Α. Σ. 27-28. Μαμασούλα Μ. Πατροκοσμάς. Ιερουργός του λόγου και της πράξης. Αγρίνιο, 2001. Σ. 130. Σεβ. Μητροπολίτου Ναυπάκτου και Αγίου Βλασίου Ιεροθέου. Ο άγιος Κοσμάς ο Αιτωλός, ως ορθόδοξος φωτιστής. Μεταλληνός Γ. Παράδοση και αλλοτρίωση. Εκδόσεις Δομος. Αθήνα 2001,Σ. 107. Jearaumede la Lance. La vie d’ Ali Pasha. Paris 1822, Стр.183. Φαλτάιτς Κ. Ο Αγιος Κοσμάς Αιτωλός εις το στόμα του Ηπειρώτικου λαού. Αθήναι, 1929. Σ. 19. Παράδοση και λατρεία σε ενα ελληνικό χωριό. Στην Αυρα Καλαμπάκας. Θεσσαλονίκη, 2003. Σ. 47.